Remember the sock that I started knitting yesterday? Yup. The needle came off the cable on the circulars that I’d been using. 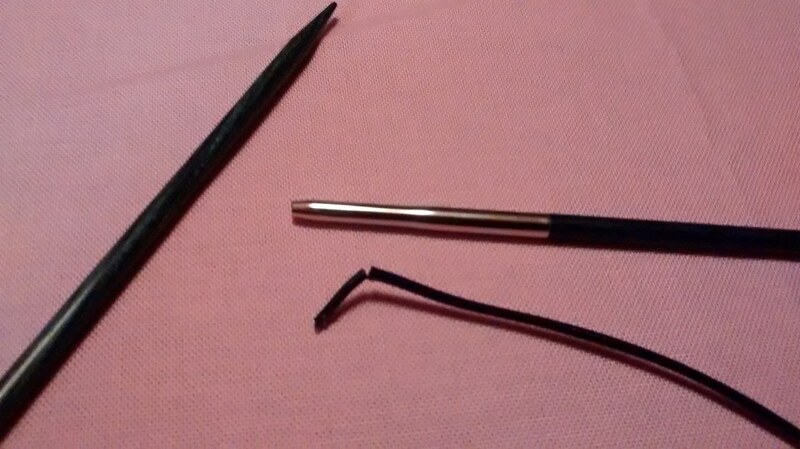 If you look closely, you can see that it’s beyond repair: the thin end of the cable broke off, so even if I inserted it back into the hollow end of the needle and tried to glue it together, it would still come off. When I knit in the round, I use the Magic Loop method with one long circular needle. I got rid of all my DPNs a few years ago, and I don’t have any more long circulars in that size. So it looks like that sock will have to wait until the new needles arrive in the mail. In the meantime, this just means that I’ll have to cast on a new sock with a different set of needles and a new color yarn. So at least there’s that silver lining. Anyone else have this happen to them before? Or any other knitting/craft-related disasters? How long of a circular needle do you use? The one that broke is approximately 38″ from needle tip to tip. I have other ones that are a few inches shorter or longer, depending on the brand. I think they’re all between 32″ to 40″ though.